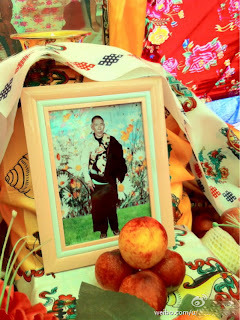 Tibetans in eastern Tibet gathered today to mark the self-immolation of a Tibetan from a nomadic family who set fire to himself and died in Chentsa (Chinese: Jianza) county town in Qinghai (the eastern Tibetan area of Amdo). Images posted online by Tibetans in exile showed crowds gathering to pile khatags (Tibetan blessing scarves) on the body of Tamdin Thar, who was in his forties or fifties, while massed ranks of armed police gather at the roadside nearby. Tamdin Thar set himself on fire early this morning in front of the People's Armed Police base in Chentsa, Malho (Chinese: Huangnan) Tibetan Autonomous Prefecture, according to Tibetan sources in exile. Armed police were seen extinguishing the flames as Tamdin Thar lay on the ground, still moving slightly, and he was then taken away in a vehicle by security forces. According to Tibetan sources in exile in touch with Tibetans in the area, he died within hours, and local people gathered in the town calling for the return of his body, despite an increasing number of armed police being deployed. The body was returned to local people at around mid-day today, according to various sources. The Chinese state media confirmed the self-immolation and death but did not name Tamdin Thar.